The 2019 Access to Seeds Index will include the first Regional Index for South & Southeast Asia, evaluating leading seed companies in the region on the efforts to support smallholder farmer productivity. Out of the 24 seed companies featuring in this ranking, eight companies are originating in India, underlining the important role the country plays in the global seed market. India is the fifth largest seed producer in the world behind the USA, China, France and Brazil. 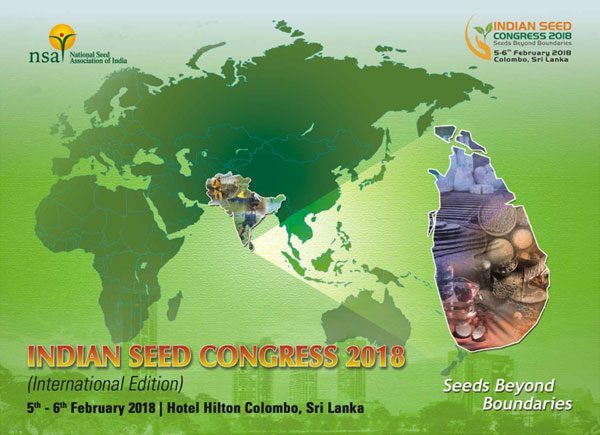 To introduce the Access to Seeds Index to the Indian seed industry, Coosje Hoogendoorn, senior research lead of the Access to Seeds Index, joined several hundred delegates for the annual meeting of the National Seed Association of India (NSAI) on 5 and 6 February in Colombo, Sri Lanka. This was the first time the NSAI held such a meeting outside India. She met with representatives of Indian and international companies that are included in the scope of the 2019 Access to Seeds Index to discuss the upcoming start of data collection for the index. Out of the 450 NSAI members, 400 are small and medium sized companies, which are very important for the last mile between new varieties and smallholder farmers. Also noteworthy were an increasing number of Indian seed companies which are exporting to other countries, in particular to nearby SAARC countries, but also to Africa. Coosje Hoogendoorn also met with representatives of the seed sector in Sri Lanka, a country which will, for the first time, be included in the geographic scope of the Access to Seeds Index. In Sri Lanka the seed sector consists of the public sector, which does limited breeding, while local seed companies are involved in seed production of public varieties and/or partner with international companies to import seed. The government has identified Good Agricultural Practices (GAPs) as a priority for all farmers, big and small, and works closely with private stakeholders such as seed companies, to develop and introduce GAP practices throughout the country.